Predators have a built-in fear of the unknown. They are inherently programmed to be afraid of anything that might want to eat or harm them. In the wild, they must be on alert for wolves, mountain lions, and even man. Horses must learn to trust things in our world that we ask them to face. Everything from haltering, grooming, riding in a trailer to trail rides and obstacle courses are potential sources of fear for the horse. How do you recognize when a horse is afraid? What is his body language? How does his behavior change? 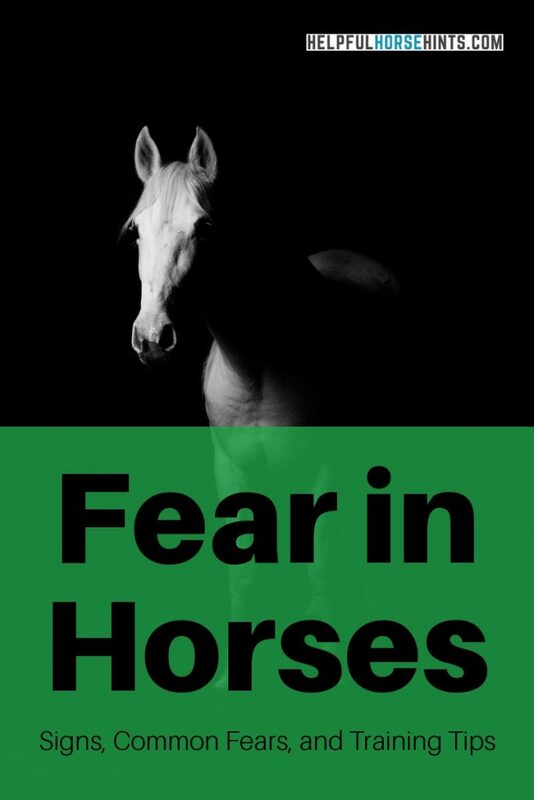 What things are horses afraid of and how can we teach them to overcome these fears? In this post I hope to address some of that for you. Here is a breakdown of what will be covered in case you want to skip ahead! Why are horses afraid of spiders? Why are horses afraid of camels? Why are horses afraid of snakes? Are Horses Scared of Pigs? Horse Scared of Fly Spray? Are Horses Afraid of the Color Red? Body language is the biggest indicator of fear in horses. Scared horse behavior is easy for experienced horse owners to see but, if you are new to horses, it might be easy to miss. Here are the 9 most common signs of fear in horses that you can watch for. One of the first signs a horse gives to indicate fear is to turn their whole focus to the object or area where their concern is. At this stage, the horse is hyper alert. It has heard something, or thought it saw something, and is focused intently on the area or item. You will notice this stage easily by observing a horses ears and focus. The horses eyes and head will be locked in the direction of the fear stimulus. His ears will also be locked forward, listening for clues as to how to proceed next. During this stage, a horse has to make a decision whether or not the item is truly scary. If the horse is afraid, it may continue to display some of the additional fear behaviors listed below. Heaving breathing and snorting is a very common sign of fear in horses. Typically when a horse is scared, they look and focus on the object, arch their neck and snort. The rapid exhalation of air is an audible clue to others in the herd to pay attention to the scary object. In a group situation, if one horse snorts the other horses will usually all look and pay attention to see if there is a threat. An arched neck on a horse is a beautiful thing. Dressage horses, in particular, are trained for this type of head carriage. It can, however, also be one of the visual clues that a horse is afraid. As with eye white, this horse behavior shouldn’t be judged as fear alone, combined with other items on this list though, it is definitely a fear behavior. A horse may show the whites of its eyes when afraid. For most horses, their eyes are typically fully colored and not showing any white when in a relaxed state. Horses typically have brown or blue eyes. In the case of a scared horse, they will often lift their eyebrow usually exposing white at the top of their eye. The position of the eye white can vary somewhat depending on where they are looking as well. Keep in mind that some horses naturally show white around their eye even when not afraid. This is typical, for example, in Appaloosa horses. 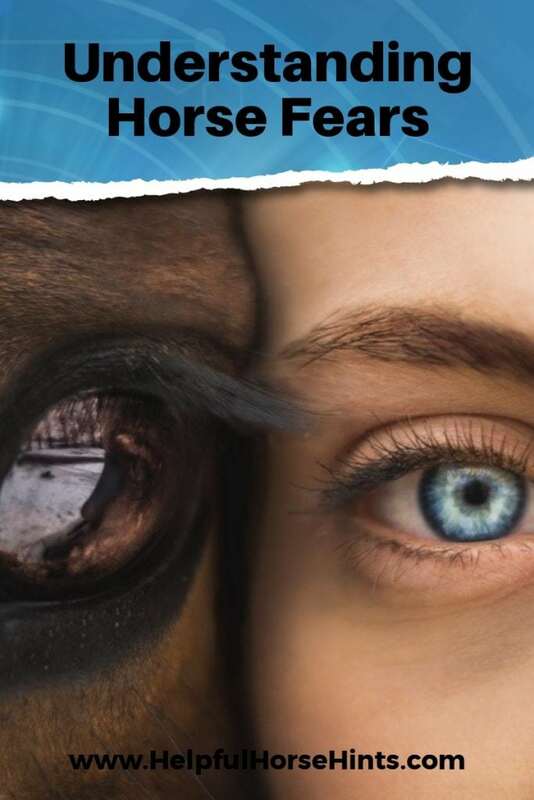 For this reason, you should consider if a horse is showing any other signs of fear before assuming a horse is afraid just because they have white showing in their eye. When asked to approach a scary object, a horse will seldom walk up to it in a straight line. Most of the time when a rider or handler asks a horse to approach something it fears, the horse will try to alter course to avoid getting closer to the thing that scares them. This usually results in zig-zag movement. There are two options in the wild when dealing with a predator, fight or flight. Stomping and Pawing are fight responses a horse can elicit when afraid. Typically a horse will run from an object or thing it is afraid of but, some horses will stay and challenge. In this case the horse may stomp one or both feet aggressively. He may also strike at or paw at the scary thing. Caution must be used with a horse that will stomp or paw. A horse with a fight reaction who is afraid of a dog, for example, could very well kill the dog. The flight response in a horse is more often encountered than the fight response described above. In a scary situation a horse is much more likely to bolt or run away from the thing it fears rather than confront it. This, of course, goes back to their nature as prey animals and their natural instinct to run from predators. Horse fear is quite an unpredictable thing. Some horses are afraid of seemingly everything. While we can’t know for sure what is going on inside a horse’s brain causing the fear, we do have some pretty good guesses. You may not have even realized some of the crazy things horses are afraid of. This list covers 11 horse fears you may not have even thought of! The primary reason horses are afraid of spiders is because spiders can move quickly out of hidden spaces. Most horses aren’t going to be afraid of small, house-sized spiders. A larger spider running across a trail, that is something a horse might get worried about. When we think about why the spider might scare the horse we have to take into account their position in the animal kingdom as prey animals. They look at everything like it is going to eat them. Anything that moves weirdly or emerges from darkness, might be a predator. Horse are notoriously afraid of camels. I know what you may be thinking..why be afraid of another herbivore. Just because both horses and camels eat grasses, doesn’t mean that horses don’t see camels as a big, stinky predator. 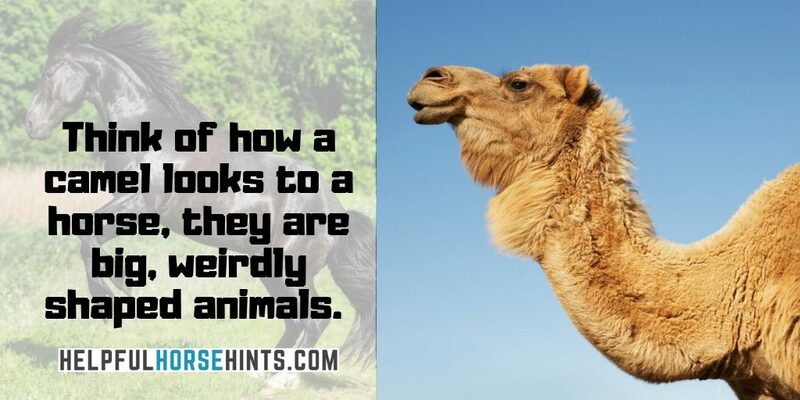 Think of how a camel looks to a horse, they are big, weirdly shaped animals. They smell bad, have long necks and make strange sounds. All of these things can be overwhelming to a horse that isn’t used to seeing camels around. The good news is that horses can be acclimated to camels fairly easily. Using standard approach and retreat or simply stabling your horse near camels will help them get used to them. Horses are afraid of camels because they are strange..so the more they see them, the less afraid they will be. Snakes are like spiders when it comes to horses and their fears. They often appear from the brush without warning. A horse’s fear can be triggered by hearing them in the brush or by seeing them emerge (or both). Think about it from the horse’s perspective, you are a big prey animal. You hear rustling in the bushes, you are SURE it is a big cat or something else that wants to eat you. All of a sudden, a windy “thing” emerges and slides across in front of or towards you. Some horses might be curious of the snake, others would rather run. It depends on the horse, of course, but many horses are scared of snakes because they aren’t used to seeing them and they tend to come out of dark places and can make sudden movements. Pigs are another animal that can scare horses for reasons similar to those mentioned for camels and snakes above. Pigs are kind of like a combo fear. They look strange, smell horrible and like to root around in bushes. They also make strange sounds. Don’t worry though, just like with camels, horses can get used to pigs pretty easily. The more they are around pigs the more used to them they get. Loud sounds can be scary to horses. It is something they can hear but not see. There are even some cases of horses being scared of their own farts. Typically though, a horse only has a fear reaction to a fart sound when it is already in a heightened state or alert to something else. Think of a scenario where you are riding your horse through the mountains. All of a sudden your horse stops, ears alert and eyes focused on the bush to your right. Your horse might turn and face the bush to get a better look. You both hear rustling and your horse is trying to figure out where the sound is coming from. All of a sudden, you or your horse farts and just like that your horse spooks and bolts off. Usually though, the above isn’t he case. Usually horses fart because they are scared or running, not because their fart scared them. Just like humans, they get pretty used to the noises their own bodies make. Some horses can be scared of storms, especially lightning. Wind too can cause horses to be afraid but this is usually due to items blowing around and not usually the wind itself. Lightning is scary to a horse because the hear loud booms and see rapidly moving white flashes. Thankfully, horses will typically learn that a storm is nothing to be worried about. Fear of water crossing is something many horse owners struggle with in their horses. What we need to realize is that the fear is not of the water. Think about it, a horse can’t survive without drinking water. They know what water is. There are reasons a horse might show fear towards water. Horse can be afraid to walk in water or cross rivers because they have poor depth perception. If the horse can’t see to the bottom he / she may be worried it is too deep or unsteady to cross. This is especially the case with most domestic horses who normally encounter water in shallow buckets in their stalls vs wild horses who are more used to puddles, rivers and ponds. Bath time can also be worrisome for some horses. The fear isn’t necessarily the water so much as the way the water is approaching them. If a horse isn’t used to being bathed, the water coming at them from the home could seem like an attack. To get a horse used to being bathed, it’s best to start with a slow stream of water coming from the hose. Start by spraying the horses legs and slowly working your way up. That way, the horse has time to get used to the feel and sound of the water hose. Fly spray can be hard for some horses to get used to. There are a variety of stimuli a horse must overcome during the fly spray process. She has to be OK with the sound of the spray coming out, she has to be OK seeing the mist coming at her and she has to be OK with the smell. All three of these things can bother a horse at first and cause them to be scared of the fly spray bottle. If you want to help your horse get used to fly spray, the best thing to do is to break down the task into its three steps. I use water because fly spray is expensive. Get the horse used to the spray sound. Don’t even spray the horse, just spray the bottle but not pointing at the horse. Once you can do this from both sides then you can try step 2. Get the horse used to the spray touching them. Again, using water, start spraying the horse. I usually start with the shoulder. I keep spraying until the horse is used to it and very relaxed. Repeat this for the whole body and both sides. Smell is the last step. Normally once a horse is good in step 2 the smell isn’t as big of an issue anymore but, if your horse is still bothered by the smell, try diluting a little bit of your fly spray in water. That way the smell is there but not as potent. Then slowly add less and less water until the horse is OK with the full smell. Here is a trainer working a horse through fears with plastic bags and fly spray. When I was a child one of my friends believed horses were afraid of the color red. I am not sure where they heard this. I’ve never seen a scientific study showing horses to fear a color. Red, Purple, Green…whatever color you like to wear or put on your horse is fine. If a horse seems to spook at a red (or any other colored) object, it is more likely because the object is scary, not because of the color of the object! There are many different theories when it comes to training a scared horse but the consensus seems to be approach and retreat. Many horses can overcome their fears just by learning the objects they fear are not going to actually hurt them. Some of the items above specifically list desensitization steps but for each type of fear, there are at least a few ways you can help your horse overcome it. Generally speaking repetition is key. Gradually ask your horse to get closer to the object, then let him back away. Here are some categories of fears and some ways you can deal with them. We mentioned camels, spiders and pigs above but here are some ways you can help your horse get over the fear of pretty much any animal. These methods could work for llamas, cows, geese, etc. Work on Repetition. Walk your horse by the animal as often as possible. Start far away but eventually, as your horse gets used to it, get closer until you can be right next to the scary animal. Establish Familiarity. Stable your horse next to the scary animal. If you do this you should start by having your horse in a larger pen. I would say 20’x20’ minimum. That way, even if the scary animal comes up to the fence to try and see the horse, if the horse is scared he can go to the back of the pen to “get away” from the scary animal. As they get used to each other you can even try introducing them into the same stall if they will be living together. Approach and Retreat. Start farther away and gradually work your way closer. This is helpful for objects that are stationary. Make the object smaller and less threatening. Thing of a tarp or plastic bag. Both items can be very scary for a horse but both can also be folded to be much smaller. It is a lot easier for a horse to be brave facing something smaller. As he gets more comfortable, slowly unfold the item until it is completely unfolded. Break the scary problem down into steps. Think about the example above with fly spray. That is an example of using steps to break a scary thing down. Another example might be trailer loading. Let’s see what we are asking the horse to do. 1. Get close to the trailer. 2. Stand on a floor that sounds hollow. 3. Go into a tight space. Instead of asking the horse to do all those things at once can you get him to stand by the trailer calmly? Will he cross a raised wooden platform or bridge that sounds hollow? Can he calmly walk between a narrow gap between you and the fence? When we break the scary thing down into pieces the horse can understand, it is easier for him to get over his fears. Here is a clip of a trainer training a horse that is spooking at rocks. 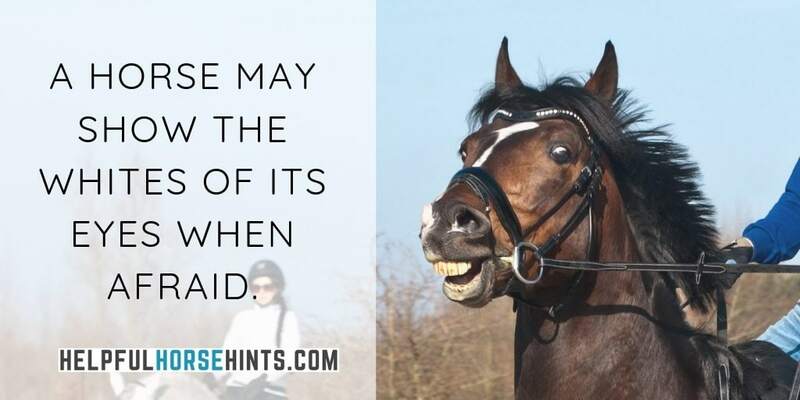 Horses can be scared of many different things, some of them quite silly in fact, but with time and patience, you can usually work a horse through its fears. Fear can be identified by watching a horses behavior and looking for tell tale signs. We have to remember that horses are prey animals and it is there nature to be cautious and fearful. In the wild, the last horse to run may be the first one to get eaten by a predator. When trying to work horses through problem it helps to use approach and retreat. Breaking the fear down into smaller pieces will help a horse to overcome those fears faster. The more fears a horse overcomes, the braver he will be. Remember, if you are struggling or just need advice helping your horse with his fears, consult a local professional horse trainer for assistance. They can give you guidance on how to handle your horse’s particular situation. Obstacles are a great way for your horse to overcome fear. Check out these articles for some obstacle ideas that may help your horse to be less afraid! What is your horses biggest fear? Have you been able to overcome it yet? Let me know in the comments below!